Cut the cookie dough into thick slices. Press the dough into 2 1/2 inch circles on a floured surface or Silpat™. At 350°F bake for 11 minutes or until golden brown. Only bake a few cookies at a time unless you have a few paper towel rolls. Using the inside of a paper towel roll (the cardboard) immediately drape the cookie over the circular form and let it cool for a few minutes. It will hold its shape once it has cooled. Continue baking and draping until you have enough shells for your party. Unwrap the candy you want to fill your shell with, such as Snickers™ and Twix™ bars. Chop them up into small chunks. Add green food coloring to white frosting to resemble lettuce and placed a dollop on the bottom of the shell. Then add in the filling and sprinkle with M&M’s™. So you're left with bags full of candy after Halloween and need something fun to do with it. Well, since the holidays are upon us and we're all on a sugar rush, we should just keep it going with Sugar Cookie Candy Tacos! I know they're a total sugar overload, but how awesome are these for a party? And they're a unique way to use up that Halloween candy! If you're throwing a Mexican fiesta, these would be such a fun dessert to serve. 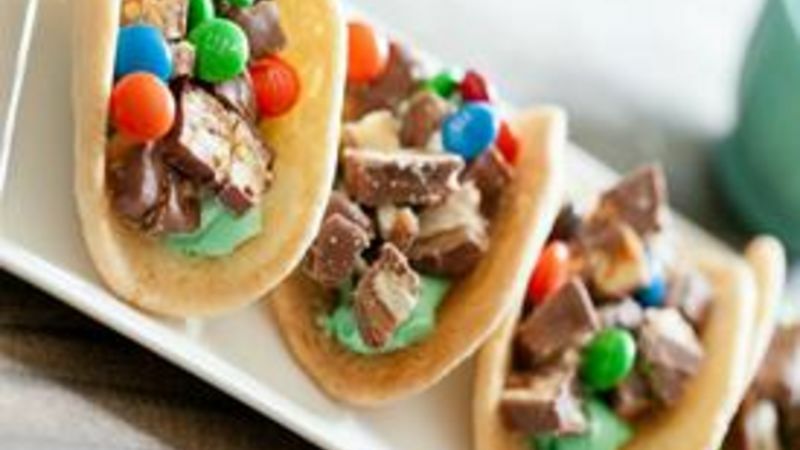 I'm sure it'll be the first time your guests indulge in a sugar cookie taco shell filled with chopped candy bars! Press the dough into 2 1/2 inch circles on a floured surface or Silpat. Bake for 11 minutes or until golden brown. Using the inside of a paper towel roll (the cardboard) immediately drape the cookie over the circular form and let it cool for a few minutes. (Only bake a few cookies at a time unless you have more than a few paper towel rolls.) It will hold its shape once it has cooled. Continue baking and draping until you have enough shells for your party. Unwrap the candy that you want to fill in your shell. I used Snickers and Twix bars. Chop them up into small chunks. I used food coloring to make green frosting to resemble lettuce and placed a dollop on the bottom of the shell. Then I added in my fillings and candies galore. Arrange them on a platter and serve! Yes, they are sweet, but my goodness they are tasty... especially if you have a sweet tooth like me.